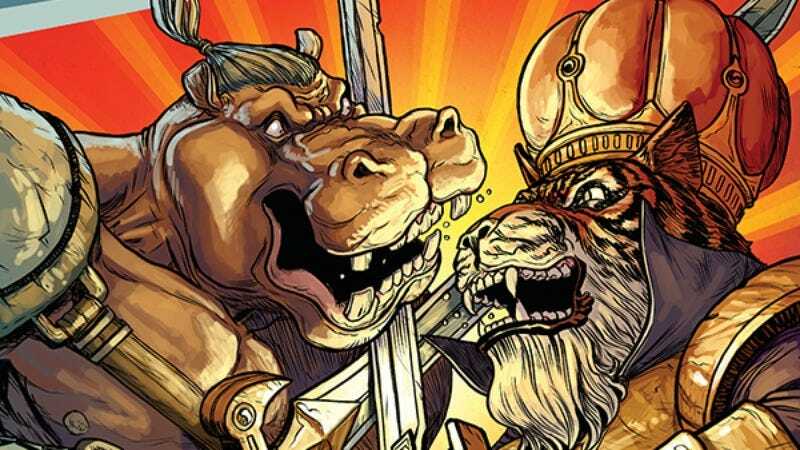 Halfway through God Hates Astronauts #9, a NASA director hippopotamus uppercuts a space conqueror tiger in the crotch, sending a wave of burger vomit rushing from the feline’s mouth. It’s the kind of absurd visual that is par for the course for Ryan Browne’s Image Comics series, a superhero humor title that loves random, ridiculous situations. It’s impossible to guess what will happen in any given chapter of this book, and a hippo punching a tiger in the balls is just one image in an entire issue full of superhero madness. “Prepare to witness action and adventure roughly equivalent to a small child from the ’80s smashing together his shirtless action figures!” This line from the God Hates Astronauts #9 title page is the perfect summary of this series’ appeal, and the juvenile spirit of this book makes it an extremely fun, consistently surprising alternative to the superhero comics at Marvel and DC. While both of those publishers have worked to diversify the styles and tones of their titles over the last few years, they have yet to offer the total creative freedom of Image Comics, which allows Ryan Browne the opportunity to build the wackiest, strangest superhero comic he can imagine in God Hates Astronauts. Browne’s ideas go straight to the page, and the impulsive quality of the writing and art gives the story outstanding momentum. In the wrong hands, that kind of spontaneous, unbridled creativity can lead to an aimless final product, but Browne maintains a strong narrative throughline as he embraces chaos in the finer details of the story. Browne’s plots take conventions of the superhero genre and amplify the nonsense factor, and the overarching storyline of this series focuses on an invasion of Earth by King Tiger Eating A Cheeseburger and his crab army from the planet Crabulon. There’s also a whole time-travel thing happening, so three different versions of the superhero Star Fighter are in the battle, and this issue deals with the messy fallout of that subplot while bringing the invasion story to a climax. How messy is the fallout? Well, two Star Fighters just time-traveled into the present-day and their coordinates had them materialize in the exact spot where King Tiger Eating A Cheeseburger’s son, Cosmic Tiger Eating A Carrot, was standing, so it’s pretty messy. While the two Star Fighters—one with a cow’s head, the other with a grotesquely deformed giant skull—face off against crab soldiers on a battlefield littered with tiger body parts, Sir Hippothesis and King Tiger Eating A Cheeseburger have a royal rumble, pummeling each other while a third party waits for just the right moment to assert his power. The issue is an action-packed showcase of Browne’s cartooning talent, full of hugely expressive characters, dynamic fight choreography, and hilarious sound effects that incorporate humor into the increasingly grisly brawls. Browne’s greatest strength is his character designs, and seeing all three versions of Star Fighter together draws attention to how much that character’s look has changed for the better since his introduction. Star Fighter begins with a traditional superhero design, but the changes made to his head mark the ways this book deviates from superhero convention, turning the studly lead hero into a giant-headed monstrosity before eventually settling on the cow-headed look of Star Grass. Star Grass is a considerably more captivating visual than Star Fighter, and those bold, bizarre design choices make God Hates Astronauts an especially attractive book for fans of irreverent superhero comics like The Tick. Browne’s artwork is elevated by Jordan Boyd’s coloring, which uses a pastel palette to keep everything light and fun, even during moments of horrible violence. Boyd’s brighter palette is perfect for a superhero comic that doesn’t take itself too seriously, and Browne’s hand-drawn sound effects are given extra emphasis thanks to the colors assigned to them. Browne also colors this issue, and there’s clearly a tight level of collaboration between the creators because there’s no noticeable change at any point. At the start of this issue, 3-D Cowboy assures readers that he’s totally sober, and he makes it a whole six pages before he pulls out a beer and starts chugging. It’s easy to imagine that 3-D Cowboy is a reflection of Browne’s level of intoxication while working on this book, because the more 3-D Cowboy drinks, the crazier the plot gets. Browne doesn’t necessarily have to be drunk to make God Hates Astronauts, but that would help explain where his ideas come from. There are no editorial restrictions on Browne, but Browne also has no inhibitions, which gives the series a childish energy that blends very well with the R-rated humor. In addition to the main story, God Hates Astronauts issues also feature fake one-page ads and back-up stories with guest artists, which make the book feel like a team effort despite being the vision of one creator. Artists like Brad McGinty and Andrew Maclean (who just released his impressive debut graphic novel Apocolyptigirl), provide a different perspective on the world Browne has created, and it’s another way that Browne uses the freedom afforded by Image to do something different from the superhero norm. That freedom has resulted in a wildly imaginative, raucously entertaining superhero title, and hopefully next month’s issue #10 (the final one solicited) won’t be the last we see of this oddball group of characters.